How old were you when you played your first Atari 2600 game? Not entirely sure. Was probably 10 or 11. Uncle was working in Venezuela when he picked up an NTSC machine. When he brought it back with him he obviously found it wasn't working and got a PAL model. Remember my cousins showing me Star Raiders but pretty sure they had their PAL machine prior to '82. I was 12 when I got mine in '82. Heh, now thsi question brings back some memories. I was about 5 or 6 when my older brother told me to go beg my parents for an Atari while in Wal-mart. I had no idea what an Atari really was, but my brother was convinced if the youngest one (me) begged my parents, we had a better chance of getting one. Expecting my parents to say "No", they loaded one up in the shopping cart and a Pac-Man catridge, and we were on our way. At the time, I didn't know Pac-Man on the 2600 really sucked and wasn't a "true" translation of the arcade original. But we all played it. I've been hooked on the system since. I still have our Original Atari 2600 with all of the original manuals. It's kind of like a family heirloom that will hopefully get passed down to generation to generation. I just got around to playing an Atari 2600 last year... When I was 13 . Yeah, I feel a little young and out of place hear, but I still enjoy playing Atari systems. Edited by Abman, Sun Dec 31, 2006 8:22 PM. I play a super stuntman on TV. First played VCS Space Invaders at a friend's house in October 1980. Got my own for Xmas a couple of months later. The rest is history. I was 24. It was early in 78 and I was hooked immediately!! LICK MY RED ROCKET LIKE A CANDY CAIN !!! Rub my belly and get a surprise in your face !! I was just going to turn 10 when my mom bought me my first 2600. The first time I ever played with a 2600 was back in 1982, just a year after this console turned up in France. The game was being offered to my father for his birthday, so in october 1982. Therefore I was almost 8 years old and my little brother was 5. The console was still the woodgrain model in its later version with 4 switches, although the 6-switch one was sold during a short time in 1980 or 1981. We had a couple games: Combat, Tennis, Space Invaders, Starmaster and Choper Command (can't recall how to write this one at the moment). The only game we almost never played was Tennis. All others were great. We never had any additional game (we didn't really think about it) and games were expensive (as far as I recall, they cost 250 french francs at that time, so $35 to $40). Sometime later in 1983 or 84 at the latest, a friend of mine got a Colecovision with Zaxxon and this was most impressive compared to our 2600. My cousin already had an Intellivision and the only games I realy liked to play were Snafu and Advanced Dungeons & Dragons: Treasure of Tarmin. Later in 86, Zelda came out on the NES. This game had similarities with D&D and when I discovered it in 1987 in the US while visiting a friend, I couldn't stop playing it. Anyway, as you can read, our 2600 really served during three of four years and then we passed to other games. I think we really stopped playing with our 2600 in 1985 or 1986 becase computers like the Amstrad CPC, Atari ST and Amiga 500 came up with really better graphics and sound, so 2600 games became boring and really limited (at least concerning those we had). I wrote a file with my memories around our 2600, if I put a hand on it I'll publish it here. Edited by david.winter, Mon Jan 8, 2007 4:50 AM. I am still waiting to play my first Atari 2600 game... and I am almost 35! I hope that playing a 2600 game is a dream of yours and that wish does indeed come true soon. Edited by JellE, Fri Jan 12, 2007 9:04 AM. I am hoping to have my very own 2600 soon! So I will be able to play all the time. Well good luck on that. If you can get a 7800... you won't be sorry. (Plays 7800 and 2600). I remember playing Warlords... another game that caused fun and family strife. Space Invaders was cool, but got repitious, so I was happy with Asteriods, since that was more random. Games games... oh I loved it!! 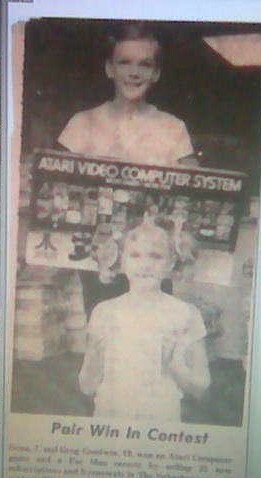 As time went on, my mom and sisters got less and less involved with Atari, and became my dad and my thing... we would dig through the Atari trash and find GAMES and stuff. Then the Atari 2600 I earned was sold for a Atari 400 in 1982. OH THE GAMES!!! That was awesome... and once I saw Star Raiders on the 400, the 2600 became a joke. But I would revisit the 2600 games from time to time. Aww Clu... you and your sister are cuties! Yeah, you know me... looking for anything and everything. I will keep your advice in mind! But one thing at a time... I would hate to have all kinds of things sitting around not being used because I am not smart enough to hook them up! First seen the thing in action when I was 4 but didn't sit to play it till I was 5 or 6. Better late than never! It was my older sisters. She still has it, and she still wont give it to me. I was 8 in 1981 when I became infected with the video game bug. Thank you Atari!! The very first time I got to play an Atari 2600 was at a friends house back in 78 or 79, which would've made me either 11 or 12 at the time. I didn't end up getting my own system until about a year later. If I'm remembering that correctly that is. It was the Summer of 1982 and I was 14. We drove to a guy my father worked with who was selling 2600 systems bundled with games out of his house and I got to choose 10 games - it took me around two hours to finally decide which games to choose (I only knew of the games that I had seen commercials for on TV). My neighbor who was about my age, also got a system around that time with mostly different games so it ended up being a good arrangement because we played the hell out of those games all summer at each others houses. I remember him having Pac Man, Indy 500, Ice Hockey, Frogger, and then Pitfall; and I had Defender, River Raid, Super Breakout, Donkey Kong, and Demon Attack. That was some of the best of times! Got the machine christmas 1978 and I was 8. As others have said, best christmas ever. Games we got were Space Invaders and Casino. I was glued to the TV and played non-stop Space Invaders. We ended taking Casino back to the store and instead got my choice... "bowling". My sister wanted to get Circus Atari.. Ok so she was right ONE TIME!! My 3 nephews had a 2600 and I played it more than they did. Probably 7 or 8, and definitely at a friend's house because it took me forever to whine my parents into buying me a 2600! (was totally worth it).